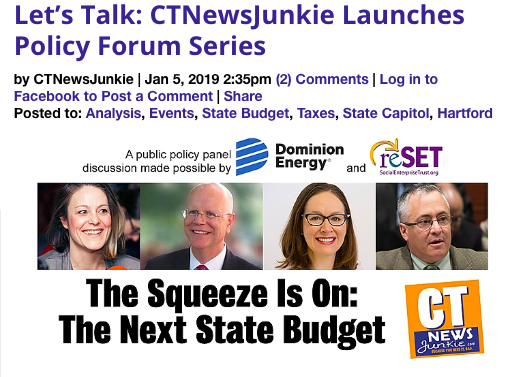 CT News Junkie is launching Let’s Talk, a new policy forum series, to explore complex challenges facing Connecticut. The series starts Wednesday, January 16th at 10am with The Squeeze is On: The Next State Budget. Revenue isn’t keeping up with past promises and tough challenges across issues will be hard to fix without resources. Panelists include State Comptroller Kevin Lembo, Katie Roy, Executive Director and Founder of CTSchoolFinance.org, and State Representative Vincent Candelora, R-North Branford, Deputy Minority Leader in the House. The forum will be at reSet, 1429 Park Street in Hartford. Tickets are available here. Next month’s forum will address Connecticut’s healthcare challenges February 20th also 10am at reSet. More details to come.